I have tried searching from the NCDA Website the application form for PWDs for downloading purposes so that I can apply for Alyana’s ID—my grandniece with autism— that will give her the same rights and privileges as the senior citizens but I could not find any. I really had to meet Cristy Castañeda, focal person for PWDs here in Pasay to get a copy. I have learned from her that only one resident from our barangay is registered. I was surprised. I know that there are other PWDs in our area so I got extra copies for them, only to later find out that there are more children with disability other than those I know of. Since I needed more copies, I just scanned the original copy that I got from the DSWD office and used it. They were accepted when I filed them yesterday. I was very happy to finally get three more IDs aside from Alyana’s with the necessary booklets that they will use to enjoy their benefits. Anyway, in case you just want to know how it looks like, and if you think your DSWD area office will accept a scanned copy you may download the form below. However, if you are a resident of other cities, you have to erase what’s written in the box under “Municipality” and “Region” if you are not from NCR. The requirements are listed below the form. 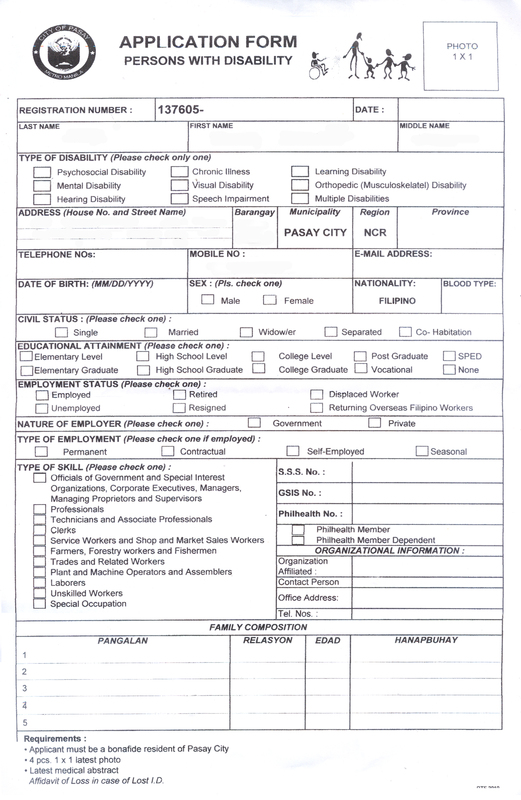 “…resident of Pasay City” on the first line must be changed however, if you are not from Pasay. Probably, it would be best if you just go to your respective City Hall. Thanks to Cristy of Pasay DSWD Office and the rest of the staff for being so accommodating! Happy to learn too that UNICEF categorized Pasay City as a Child-Friendly City. Incidentally, I was given for some suggestions if I have any, a copy of a proposed ordinance on “… providing for child survival, development, protection, and participation, and establishing a comprehensive children support system in Pasay City…” I browsed on it and I just believe that the Non-Handicapping Environment (NHE) concept should be injected, and BP344 should be stressed since that law affects all PWDs not just the adults. If the Pasay City Council is really bent, serious and sincere in keeping a Child-Friendly City, then they should consider the implementation of the Accessibility Law in the whole of the city as soon as possible. There was no mention of BP344 anywhere in the said proposed ordinance. It is just good that they are passing it around to concerned individuals for suggestions and additional ideas. For that alone, congratulations!! !